Most casual mobile games can be fully enjoyed with nothing but on-screen controls. However, there is quite a selection of more complex mobile games where a controller is a must if you wish to experience the game properly. After all, if you’ve ever tried aiming with an on-screen joystick, you’d know what we’re talking about! Not to mention how much of a pain it is to play emulated classics with on-screen buttons. 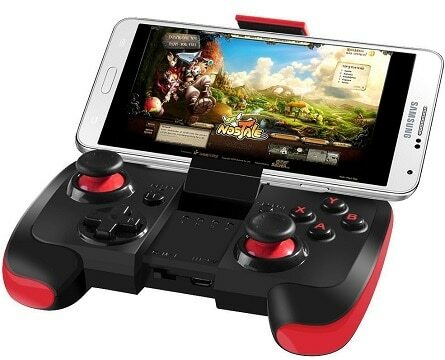 Luckily, there are plenty of controllers compatible with Android devices that can help make your mobile gaming experience more entertaining. On top of that, there are also clips compatible with both the Xbox and the PlayStation controllers, in case that you might want to use either of those controllers with your smartphone or tablet as well. The first on our list is a controller from Beboncool, a compact little controller with a simple design. The button and stick layout reflect what we can see on the Xbox controller, and the build quality itself is actually a bit better than what you’d expect from a controller at this price tag. Input-wise, all of the controller’s 12 buttons are very nice – face buttons are responsive and quiet and the analog sticks glide smoothly. The triggers are not pressure-sensitive, although that is to be expected considering the price. The only minor issue that most people agree on relates to the D-pad, which is a bit stiff, although it is equally as responsive nonetheless. As for the extra features, the controller comes with a built-in clip designed to hold phones up to 6 inches in size. Furthermore, it is equipped with a 350 mAh rechargeable battery which is more than durable enough for mobile gaming sessions, and as a plus, Beboncool guarantees full compatibility with Samsung VR games. So, all in all, this is a very solid budget controller that is compatible with almost all the games available on the Play Store, and its simple rectangular design makes it very easy to transport. Next up, we have a controller made by Bounabay. 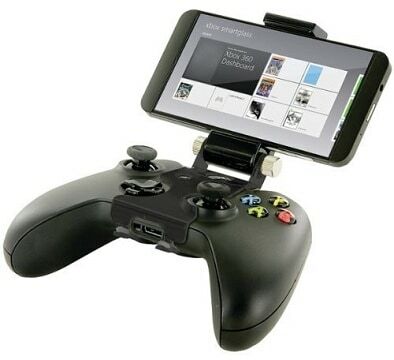 Their take on an Android controller is a fair bit pricier, but is also of higher quality. At first glance, it looks very similar to a PlayStation Vita when the phone is placed inside, which is a very good thing from an aesthetics standpoint. It has 14 buttons: two analog sticks, four face buttons, a D-pad, two bumpers, two triggers, not counting the several auxiliary buttons thrown in there. Much like the Beboncool controller described above, it fits devices up to 6-inches in size, although Bounabay’s solution is more elegant than a protruding clip. All the buttons are as responsive as you’d expect out of a $40 controller, it is highly comfortable to use, although it might feel a little cramped, especially the right-hand side. Other than that, there are no major issues with it, although the price might raise some eyebrows. So, in the end, while this is a very well-built and would make for a great pocketable controller for your phone, it is quite pricey, especially considering that you can get a proper console controller for a bit more or a better value controller for a bit less. And finally, there’s the G3s controller made by GameSir. 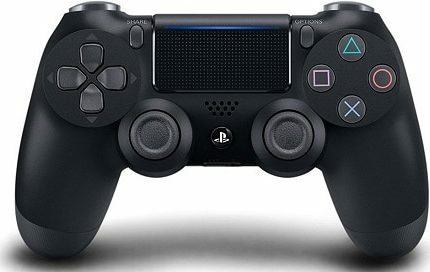 As is obvious from the design, it borrows heavily from the DualShock 4, something that can be both a good and a bad thing. That is, the extra bulk makes the controller more comfortable to hold, but it also takes away from its portability. Like Bounabay’s controller, this one also has 14 buttons, excluding the auxiliary ones. It is quite well-built, especially considering the low price, and all the buttons are as responsive as you’d expect. What’s more, the home and face buttons even come with a built-in backlight, giving it a somewhat more premium feel. A removable clip is also included in the package, and it, like before, can support phones with diagonals up to 6 inches. Furthermore, the controller comes with a 600 mAh battery, which is quite hefty as far as controllers are concerned. Users report a battery life of up to 15 hours, which is unlikely to leave anyone wanting. All things considered, the G3s is quite a bargain at its current price. It is solid, reliable, with great analog sticks, and it even looks quite good for a budget controller – barring that awful logo on the front which looks like it was just typed out in MS Word. 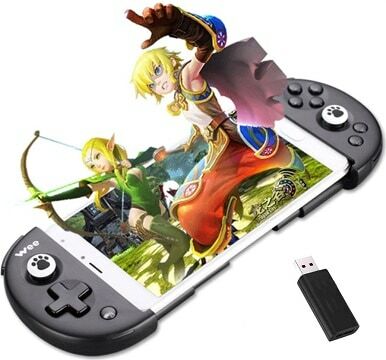 The only issue that we have with it is that it is not quite as convenient to carry around as the above two controllers, but after all, it wasn’t designed specifically for mobile gaming. Assuming that you already have a PlayStation 4 or an Xbox One controller (which is very likely), getting a standalone clip for your controller is much cheaper and more convenient than buying an entirely new controller just for your phone. 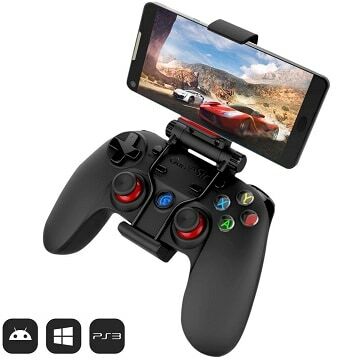 So, if all you’re looking for is the ability to play some mobile games occasionally and don’t need a separate controller to carry around with you, simply getting a clip for one of the controllers you already own would be more cost-effective. First, we have the smart clip made by Nyko that was designed specifically for the Sony DualShock 4 controller. It is mostly made of black plastic that blends well with the default black DualShock 4, although the material itself does feel somewhat cheaper. The clip fits the DualShock 4 like a glove, although it does cover the edges of the touchpad and makes the options and share buttons a bit hard to reach, but that’s mainly an issue if you plan on using the controller on the PS4 or your PC, too, without actually removing the clip. All in all, we can highly recommend this clip for anyone who has a DualShock 4 and is interested in playing games on their mobile devices and/or potentially taking advantage of the PS4 second screen capabilities enabled by the PlayStation app. And then there’s the clip designed for the Xbox One controller, and this one is made by Dainslef. It is secured to the controller by clamping onto it from the underside, unlike the above Nyko clip that covers the front of the controller instead. While the clip itself is quite stable and the more minimal design is sure to be appreciated by many, it should be noted that this clip completely obstructs the controller’s extension port and headphone jack. Granted, this isn’t much of an issue when gaming on your phone, but is bad news if you want to use those features on your console or PC without having to remove the clip every time. Other than that, the clip may not be as good-looking as the one from Nyko, but it definitely gets the job done at a very low price. 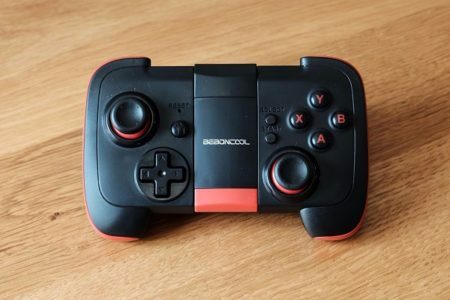 As far as we’re concerned, the best Android controller available right now would have to be the one made by Beboncool, and for several reasons. 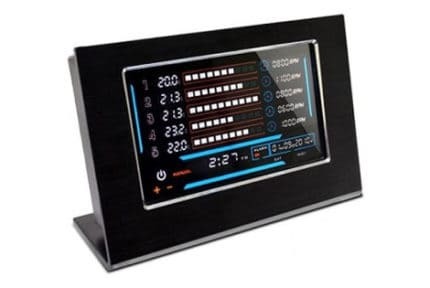 First of all, there’s the indisputable great value that you get for your money – it is not only affordable, but is very well made and all the controls are highly responsive. 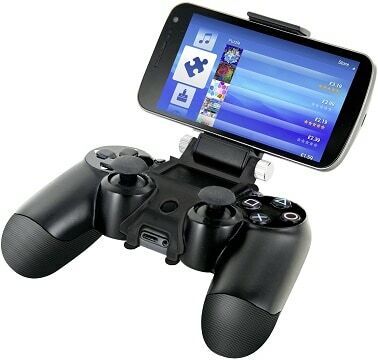 On top of that, it is very well suited for mobile gaming in that it is very easy to transport. Of course, the very basic triggers might be a deal-breaker for someone looking to play shooting games on their phone, which is not an uncommon occurrence these days, what with even PUBG being ported to mobile platforms. If it is shooters you’re looking to play, then the GameSir G3s might be a better choice. If you’re more of a sucker for aesthetics instead, then you might as well get Bounabay’s controller, as it is arguably the best-looking of the three, as pricey as it may be in comparison.